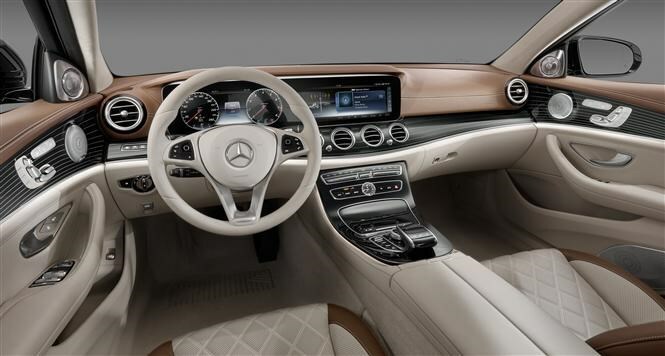 No it's not the cockpit of a motorshow concept car or a compact Mercedes Benz S-Class limousine - this is the new E-Class cabin. You get a huge widescreen-display and LED lights across the dashboard and around the centre console, plus supremely comfortable seats. Parkers secured an early viewing of the all-new 2016 Mercedes Benz E-Class at the home of the manufacturer in Stuttgart. The dashboard stretches from door-to-door and features a new widescreen display, backlit by LED lights so it looks like it's floating. In fact, you won't find traditional bulbs in the interior at all - and the LED ambient lighting system has a choice of 64 colours. Tick the box for the optional Burmester 3D stereo and the front door tweeters and roof speakers are also backlit. Mercedes Benz S-Class owners will recognise the four central air vents which lead down into the centre console, flowing into the armrest. 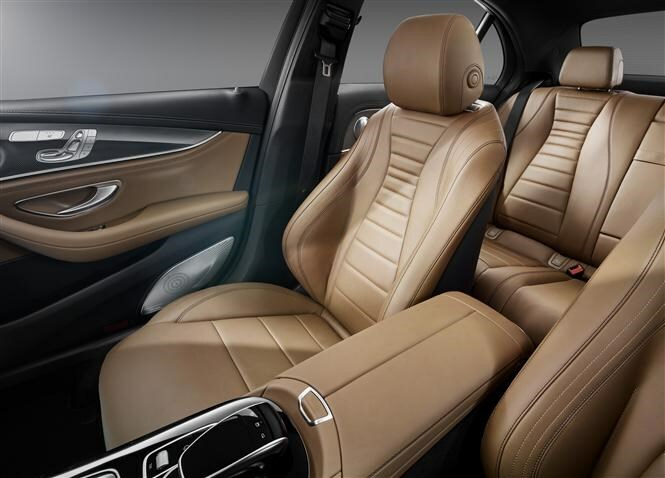 There's open-pore wood and metal-woven fabric like a luxury yacht might feature, and a choice of two-tone leather coverings for the dashboard. Buy a standard car and you'll get two round dials as normal, but a dual-screen display is optionally available. You can customise the look of the dials with a Classic, Sport or Progressive scheme. The central display shows media information and the sat-nav map, which also shows the nearest fuel stations, with the current price of whichever fuel you need too. Two steering-wheel mounted thumbpads are used to navigate the menus, using an intuitive swiping motion left and right and up and down. As well as looking great, the new seat design has a thinner construction, boasting an extra three inches of knee room in the back. Avantgarde line cars give better lateral support, and the sporty AMG chairs have deep side bolsters and a wide shoulder section. The optional Designo seat should suit everyone with its diamond pattern and enhanced lateral support. See the new Mercedes Benz E-Class at the Detroit Motorshow in January 2016, and read our review of the current car here.